The US Dollar has since the 24th of april this year broken out of its holding pattern. And done so convincingly by breaking down to the downside. On top of this major breakdown of structural support, technically speaking the 200 day moving average and the 50 day moving average are about to make the cross of "death" for the US Dollar as well. Signaling major downisde to be had moving forward. You can tell as well, that the 200 DMA has been a major support in the last 2 downturns but now has failed to remain support. On top of all of this, there is not much good news coming out of the United States of America. Economic indicators are bad. The Federal Reserve is perhaps not raising rates after all. Deficits are rampant. And Political turmoil is apparant with the Trump Administration. The dollar is not even the safest house in a bad neighborhood anymore. Growth is steaming ahead for instance in the Eurozone, where the threat of the French Election has long passed. No more political uncertainty in the Eurozone. Keep an eye out for this. So fundamenally the dollar is not doing too hot either. But what about historicly (very long term). Well, after the DOTCOM bust the dollar weakened significantly. And it is sending us signals, that the next 8 years probably will be with a weaking dollar. So is the cycle. Look for a good place to enter a short vs the dollar and profit. Putoptions in DX (US Dollar Index) or calls in the inveur (Euro Index) to be advised. But remember to get as long a run time as possible. Dont bet the house though, nothing is for certain! And do your own damn research in these matters too! Welcome to Steemit! We're happy you could join us. I flagged half of those comments. You reputation dropped from 35 to 7. 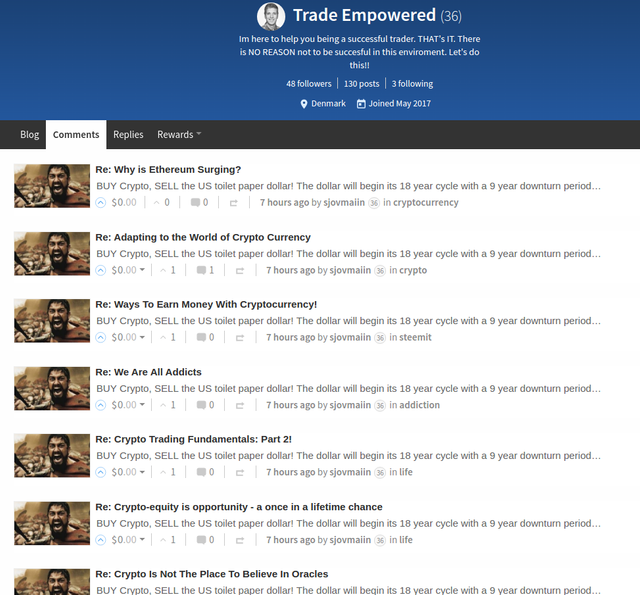 If it will go below 0, then your content will be hidden by default on Steemit. You say i spam? I Inform people. You on the other hand have posted 1400 times on peoples videos with crap like this. Talk about a spammer. I will perhaps follow up on this in detail in further posts! Awesome post. Great info and I have added you to my group. 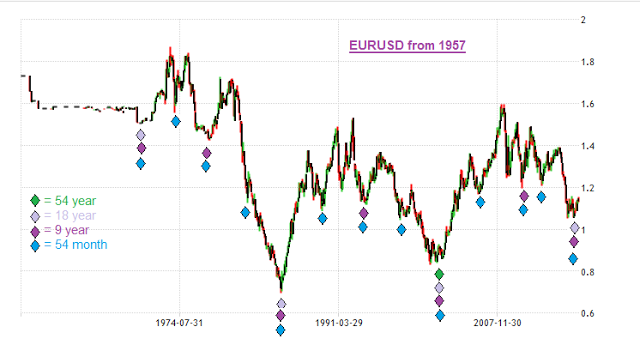 Hi, your chart shows eur/usd from 1987, im confused. The euro did not enter production until 2002. IT changes from the D-mark to the Euro. Paper money is a scary proposition these days, almost like a high POS coin that just produces much more than the demand will ever be!